A good conference or workshop will expose you to new research, new people, and new ideas. A great one will compel you to rethink previous assumptions and upend your own work with novel insights. The 2013 Canadian History and Environment Summer School (CHESS) on Vancouver Island was a great one. Graeme Wynn and Richard Mackie led a superb summer school this year based out of Vancouver Island University in Nanaimo, British Columbia. Drawing from their respective expertise in historical geography, they focused this year’s CHESS on a place-based exploration of the east coast of central and southern Vancouver Island. They took us to numerous sites along the coast from Nanaimo to Cumberland to Campbell River and to Courtenay. We explored a long, fascinating history of complicated relationships between changing human communities and the natural environment of Vancouver Island. The field trips and our seminar sessions back at VIU led me to think about the environmental history of Vancouver Island in new ways and to ask new questions about the frameworks historians use to interpret evidence of human alterations of the environment. Inside the study at Haig-Brown House. Our visit to Roderick Haig-Brown’s historic family home in Campbell River set some new ideas in motion as we discussed his conservation thinking and ideas about nature. In addition to being a renowned fly-fishing writer and naturalists, Haig-Brown was an influential conservationist. As Arn Keeling describes him, Roderick Haig-Brown was “the foremost conservationist in British Columbia from the late 1940s to the late 1960s.” We had the opportunity, as a group, to read a passage from Measure of the Year(1950), a collection of reflective seasonal essays, while sitting in Haig-Brown’s beautiful book-lined study. The passage called into question assumptions about progress and rapid industrial development, common in mid-twentieth-century British Columbia and elsewhere in Canada. It was indicative of what made Roderick Haig-Brown such a unique and important figure in BC environmental history. He attempted to challenge fundamental assumptions about what he increasingly saw as a troubled relationship between people and nature at the same time as he struggled to reconcile his own thinking about the utilitarian and moral values of conservation. This reflective moment in a truly charming home along the banks of the Campbell River was an occasion for us to examine not just the intellectual history of conservation and environmentalism in BC, but to ask critical questions about the meaning of progress in both the past and the present. How do human societies define prosperity and abundance and what are the ecological consequences? For Haig-Brown, large-scale dam construction was a step too far beyond a tolerable limit of environmental modification. It sacrificed ecological values at the alter of industrial development in a way that would impoverish British Columbians. The destruction of fish habitat in the name of progress was an occasion to challenge the definition of prosperity and abundance in his time. We carried some of these broad critical ideas about the relationship between humans and nature to theComox Estuary as we marched out onto the tidal flats for a field tour of some extraordinary archaeological research. Nancy Greene and David McGee led us across the wind-swept flats to a series of small neon-coloured flags staked out in the sand. From the ground, the flags appeared to be randomly spread out in all directions, but upon closer examination they marked out very clear patterns of ancient intertidal fish traps throughout Comox Habour. As Nancy and David described their tireless research of using GPS mapping technology to mark out every remnant cedar stake on the tidal flat, the tremendous significance of this archaeological discovery became evident to the group. What they had uncovered was a remarkably well-preserved, elaborate and complicated system of enormous intertidal fish traps capable of capturing tens of thousands of pounds of fish. We stood atop direct evidence of a pre-Columbian Aboriginal fishery of an industrial scale on the Northwest Coast. It was breathtaking. Tidal flats of Comox Harbour. The evidence of such a complex undertaking led us to ask a series of fascinating questions. How were these traps constructed? What kind of social organization and division of labour was required to build, maintain, and operate this fishery? What effects did this massive fish harvest have on the accumulation of wealth and political power among the First Nations of the Comox area? Did the demand for cedar stakes require an equally elaborate forest management system? What were the ecological effects of the operation of this fish trap network and what were the consequences of the termination of this activity upon contact with Europeans in the nineteenth century? What does this sort of resource extraction activity tell us about the human societies who inhabited this region prior to European colonization? 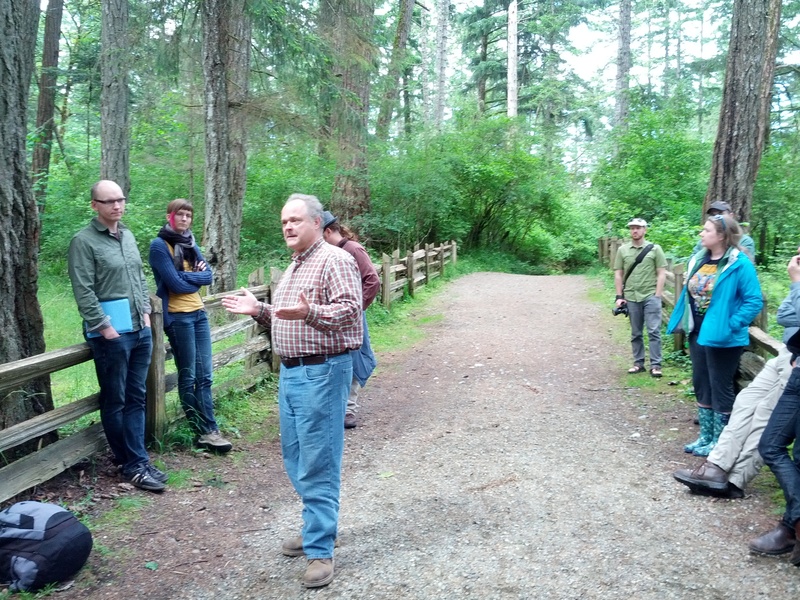 Richard Mackie discusses the history of logging in Comox Valley among rare stand of remnant old-growth forest. As we left the Comox Estuary filled with questions about Nancy and David’s incredible research, we started up the next day back at Vancouver Island University, where we discussed Richard Mackie’s work on the Comox Logging Company in Island Timber. Richard took us through the incredible social and environmental history of the logging industry in this part of Vancouver Island in early twentieth century. In a relatively short span of time of just nearly thirty years, this company and its employees removed millions of board feet of old-growth timber, leaving behind only “tall stumps of trees; snags; billowy, shaggy treetops and thick branches; and timber with knots, twists, or any other imperfection.” The ecological transformation of forest removal climaxed in 1938 with an enormous fire that consumed the remaining debris and slash of the logging company in a terrible inferno. The European colonists who worked for the Comox Logging Company affected an incredible alteration of the ecology of the very same region where we encountered evidence of a substantial ancient intertidal fish trap system. Here was an exemplary case of two different human communities occupying the same environment and modifying its ecology for different purposes and with different results. For more than a thousand years the First Nations of Comox Valley generated wealth and prosperity by harvesting the abundant quantities of fish from the estuarine environment of the harbour. Within a period of less than fifty years, European colonists extracted enormous wealth from the timber resources of the Comox Valley by stripping away its old-growth forest cover. 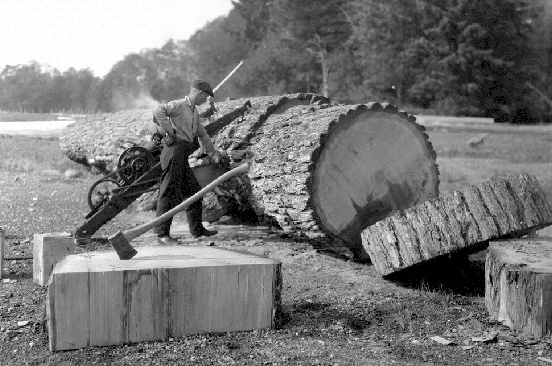 Cutting up a Douglas-fir at Comox, 1925. Source: BC Archives, I-51808. Environmental historians, I think, might ask some of the very same questions about this kind of relationship between European colonists and natural environment as we did of the indigenous people of the region. What does this sort of resource extraction activity tell us about the human society that came to inhabit this region of Vancouver Island? What were the social, cultural, and intellectual factors that led Europeans to exploit the old-growth forests of the Comox Valley to the point of exhaustion? Why did Europeans use the natural resources of this region in such a radically different fashion from its indigenous population? Because this year’s CHESS had us focus on a particular place and examine its history across different time periods, it forced us to think more broadly about environmental history and the big questions we might ask of our own subjects of research. It left me with a compelling sense that the ecological consequences of historical human interactions with nature can offer important insights into those human societies and the structures of power that govern human-nature relations over time. Arn Keeling “‘A Dynamic, Not a Static Conception’: The Conservation Thought of Roderick Haig-Brown” Pacific Historical Review 71 (2) 2002: 239-268. Richard Somerset Mackie, Island Timber: A Social History of the Comox Logging Company, Vancouver Island (Victoria: Sono Nis Press, 2000), 263. Sean Kheraj is an assistant professor of Canadian and environmental history in the Department of History at York University. He blogs at http://seankheraj.com.